BTC/EUR trades 3.58% higher on the day at 5633 at the time of writing. The pair has broken above 21-EMA at 5526, bias higher. 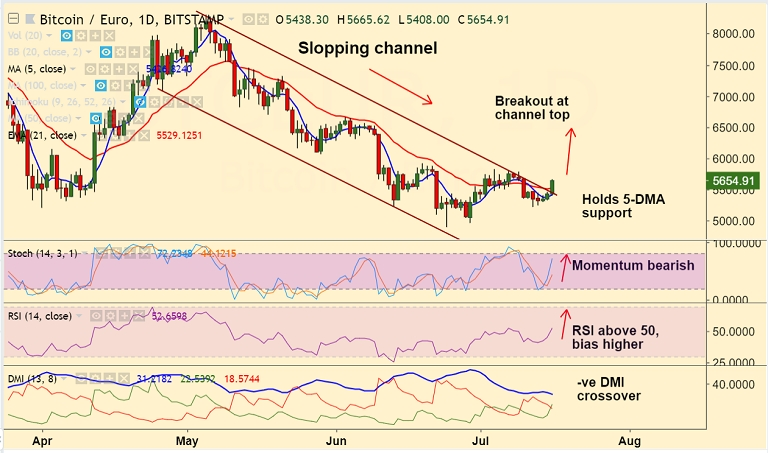 Price action has shown breakout at channel top, we see scope for further upside. Technical indicators on daily charts are turning bullish. RSI has edged above 50, and biased higher. Stochs have rolled over from near oversold levels. +ve DMI has shown a crossover on -ve DMI. FxWirePro Currency Strength Index: FxWirePro's Hourly BTC Spot Index was at 160.334 (Bullish), while Hourly EUR Spot Index was at 36.3851 (Neutral) at 1215 GMT. For more details on FxWirePro's Currency Strength Index, visit http://www.fxwirepro.com/currencyindex.